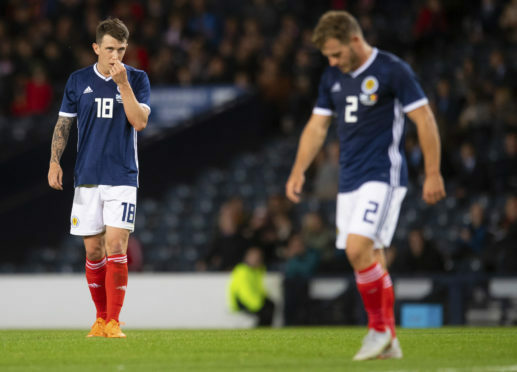 Ryan Jack (left) and Ryan Fraser reflect on Scotland's 4-0 defeat. Scotland gifted three of Belgium’s four goals last night, with Jack caught in possession by Youri Tielemans for Michy Batshuayi’s second and the visitors’ fourth goal at Hampden Park. Albania picked up a 1-0 win against Israel while Scotland were being given the runaround by Roberto Martinez’s men, getting them off to the perfect. Scotland will look to match them on Monday night but a far more disciplined performance will be required. Former Aberdeen midfielder Jack, who joined Rangers last year, was a late replacement for Tom Cairney after the Fulham man dropped out through injury. Despite not making the initial squad, Jack was still pleased to be involved against the Belgians.